Poignant letter does not justify events in Yitzhar, but claims that state seems to be fighting 'price tag' with a 'price tag' of its own. 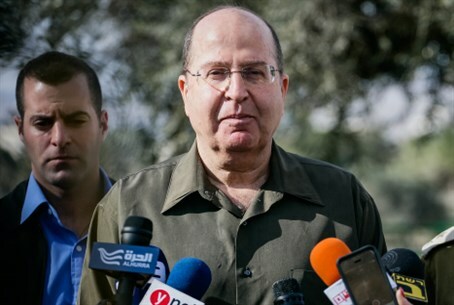 The Yitzhar community collectively sent an open letter to Defense Minister Moshe Ya'alon Sunday, in protest of the "price tag" and incitement they feel the Ministry has levied against the small Samaria town. "Price tagging" usually refers to acts of criminal damage or vandalism perpetrated by extremist groups against Arab or IDF-owned property, in revenge for terrorist attacks or IDF demolitions of Jewish-owned homes. The community of Yitzhar has been at the center of clashes between the IDF and extremists believed to be behind price tag incidents, including the slashing of a local army commander's car tires. But Yitzhar leaders say the way authorities have dealt with the phenomenon - which they themselves have condemned - has simply exacerbated the problem and amount to acts of revenge and collective punishment far worse than regular "price tags". "We want to see you, and other senior officials in charge, as the 'adult' in Israel, fulfilling the role of rulership with discretion and common sense, in order not to deteriorate the situation we face now and worsen it," the letter begins. "Unfortunately, we feel that the system does not work that way." "As the head of the defense establishment, and of a government committed to act fairly toward all citizens, we are surprised, shocked and amazed in light of the conduct of the defense establishment regarding the unjust treatment of [the community following] the events that took place against security forces [last week]." "Over the past week, the community of Yitzhar has been suffering from an unprecedented delegitimization campaign in various media outlets," the letter continued. "These significant events prompted, obviously, a furious debate about the Yitzhar community, even among different security and government officials, and raises ideas on how to 'reverse' or 'handle' the 'settlement' of Yitzhar." "We see recent demolitions in Yitzhar as the defense establishment's 'price tag' against our community, against all of residents living here," it continued, referring to the demolition of several homes in the community in what residents say was an act of simple collective punishment. Those demolitions triggered further clashes, including an incident in which an IDF outpost was demolished in retaliation. The Yitzhar community emphasized - as they have throughout the drama which has unfolded throughout the past week - that the clashes between security forces and its residents are the result of a band of individuals, not a collective effort by the community as a whole. "No words are written here to give justification and support for attacks made ​​against the security forces by a few individuals," the letter states. "As community leadership, we expressed our disapproval, both to residents and to the media, in relation to recent events [of this kind] and other events in the past." "On the other hand, it cannot be that the defense establishment acts vindictively toward residents who had nothing to do with these events, to 'punish' all Yitzhar residents over accusations of being involved in clashes that were not instigated by them," the letter continues. "How do you plan to eradicate 'price tag' attacks when you do the same against normative citizens?" The community also noted that the IDF's crackdown on Yitzhar is even greater than the State's crackdown on actual terrorists. "Have you used this practice, on the other hand, on our Arab enemies, who from day to day risk their lives and the lives of soldiers by throwing stones, launching Molotov cocktails, and firing guns [at the IDF]? Did you destroy their illegal homes in retaliation for their terrorism?" "Is it possible to compare the number of illegal homes here, which are occasionally demolished by security system, compared to the amount of illegal construction which has been growing on the part of our Arab neighbors - and which the system does not lift a finger against?" "How do you expect children and youth to be educated to respect the security forces, when injustice occurs against them before their very eyes 'by rule of law'? Are Yitzhar residents not entitled to human rights as any other citizen in the State of Israel?" The Yitzhar community particularly protested to the IDF occupying a key yeshiva [Torah academy] in their community, which caused an uproar as soldiers commandeered the religious study hall for an army base. "Last Friday, aggressive action - which was extreme by any measure - was taken [against Yitzhar] that indicates hysteria and loss of good judgement in the government," the letter says. "The Border Police, with the help of a seizure order from a commanding officer, took control of the Od Yosef Chai Yeshiva for the purposes of establishing an army base there over the next two months." "We know of no similar case, the commandeering of a holy place [. . .] to turn into an army base - with all of the holiness of the place degraded!" the letter lamented. "There is no lack of mosques which preach the murder of [Israeli] civilians, and there has not been such a step taken against them." "We see this move as causing great damage to the sanctity of Israel, an unprecedented absolute objectionable act among residents of the community as well as various circles of the Israeli public." The Yitzhar community concluded the letter by requesting that Ya'alon ease the campaign waged against their tiny town. "In summary, we request: Discretion in terms of taking measures in response to the various events that took place in Yitzhar; and the immediate withdrawal of the Border Police from the Od Yosef Chai yeshiva." The letter also stated that a response from Ya'alon would be welcomed.